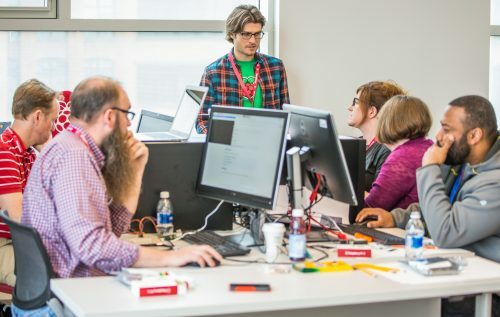 Picademy is a two-day training that engages educators in digital making. Participants are introduced to a range of computing activities on day one. Highlights include: using physical computing to control components like LEDs, buttons, motors, cameras, and sensors as well as coding live music with Sonic Pi. On day two, attendees apply their learning by creating and presenting their own digital makingprojects. Each cohort that attends is a mix of educators representing many different subject areas. Our aim is to create leaders in education who are equipped with skills to train others in their community. When are you bringing Picademy to my hometown? We currently offer Picademy in the UK and North America, and don’t yet have plans to run the programme in other parts of the world. We support our global community of educators through our online training courses. 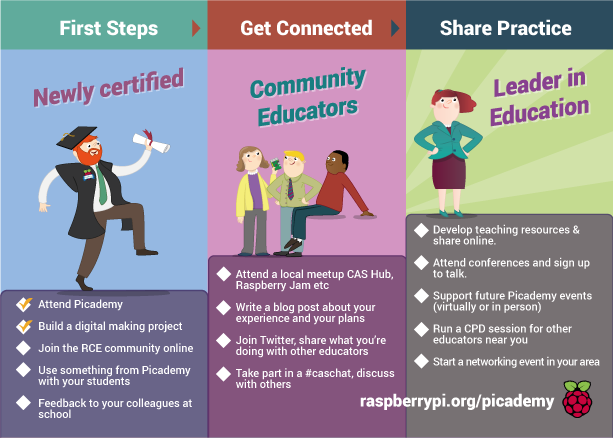 Who can attend a Picademy? Picademy is about building an educator community who can support each other and grow the movement. Can I have access to the course materials? What if I can’t make it to a Picademy? If you can’t make any of our live events, it’s worth looking in to our free online training courses instead. Who can I speak to about Picademy? Both the North America and UK training teams can be contacted at [email protected].